Any of you other parents watch Thomas the Tank Engine? My son is pretty obsessed so we have seen the Adventure to Misty Island episode a couple of times. There is a part where they go over the "Shake Shake Bridge". 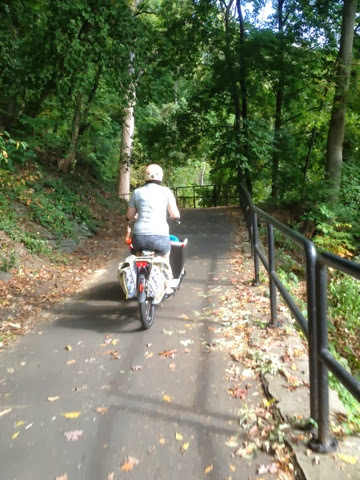 Yeah that bridge pretty much sums up riding on Forbidden Drive here in Philly with cargo bikes. 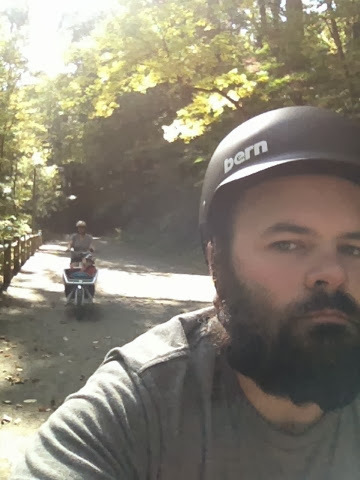 My husband's birthday was on Saturday so we decided to take the very unseasonably warm October day and ride the Wissahickon trails by our home. 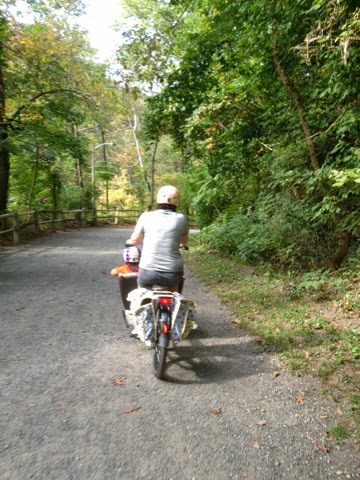 We walk it (and biked parts on our smaller bikes) but I had been putting off biking with our cargo bikes. 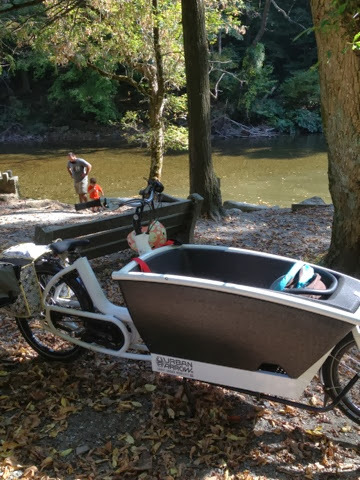 I knew it was possible to do the trail on them as two other Philly bakfiets owners have done them, but it made me no less nervous and exhausted thinking about it. Initially the trail is paved with a series of quick ups and downs. Then over two bridges (that freak me out on my light road bike let alone cargo) and finally the main part you ride (up hill the whole time) is on gravel trails. My battery wasn't very charged and I didn't find the power useful on gravel so I rode without it on. Riding the trail was very freeing. There was no quick starts and stops like in city traffic, it is also very wide for walkers, animals and bikes. The views are drop dead gorgeous and I almost forgot I was actually still in Philadelphia like the river was a bit smelly to remind me. The bike handled gravel okay. The big gravel was a bit scary as my bike felt as if it was sinking in like biking in sand. Smaller gravel wasn't bad and I didn't kick up any. I totally rolled through some horse poop. Gross. 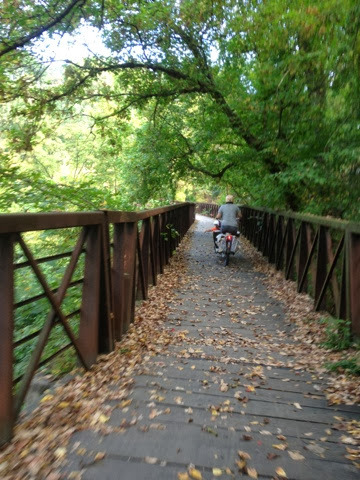 The bridges were less then desirable smaller bikes alone make the wood bend and flex. My big bike. Yikes I felt the shake, shake. Over all the total ride was 8.6 miles. Plus another 4 Misc. miles from morning soccer and some late lunch. 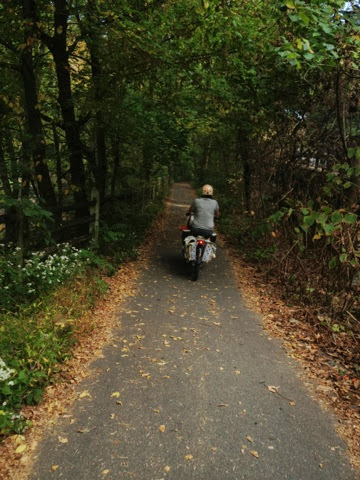 It was a lovely day to ride. I just got my eyes wet looking at this wonderful trail pictures! 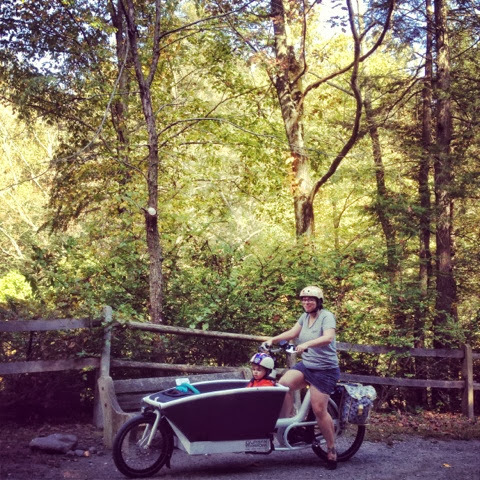 Can there be a better way of enjoying such trails than a e-assisted cargo bike? Ok, let me introduce myself. I lurked your blog since long time. I live in Trieste, Italy, at the tip of the Adriatic sea. We have wonderful trails all around, lot of hills (1000 ft is just the starter if you want to reach the city outskirts) and little to none care for cycling from local authorities, let alone the car drivers. Didn't care much until last year. I cycled happily with my usual mountain bike. Biking is, along skiing, the only physical activity I like. But last year our family increased 50% the head count :-) So what to do? ow will I be able to cycle with the baby? I wondered. How nice would it be, I was thinking, to have one of those bikes I saw in my several trips to Holland. But with electric assist, otherwise such a heavy bike, here, is unconceivable, and unmovable. So I started searching the net, and, lo and behold, it DOES exist! My enthusiasm is rising every day, now I'm really near to pull the trigger. Still have to make sure my wife agrees 100%. Such an expensive and uncommon bike makes sense only if it totally replaces one car (we have two now, with one just sitting in the garage). I feel we can do it. But really, I'd be the first in the city to own an UA, maybe even in the whole Italy. Here, bikes are socially accepted as a fitness tool only, not as a transportation mean. It is typical to put the bike on the car, travel 40 km with the car just to ride then 20km with the bike. And 40km car travel back. Not logic. But still, a bit embarrassing to be the first against the stream. So, ok, I'm still searching a bit of info and will decide before summer comes. Just have to figure out how to hold the baby, which will be 7-8 months old at the time. And how to ensure the bike against theft. Thank you for the time you take for maintaining this blog, which is a real treasure trove of information for people like me. Will keep you informed about my decisions. Thank you again! Let me know what you decide and feel free to drop me an email if you have any specific questions! This bike has been amazing. carrying kids is such an ease :) even on hills and trails.